When Americans are polled about their favorite foods for grilling, steak always heads the list. A slab of beef is the perfect food for the grill: Its broad surface area soaks up wood and smoke flavors, and it cooks quickly. The most common mistake made in grilling steak is overcooking it; the second most common is undercooking. And in my experience, most grill masters fear both. Because, let’s face it: A great steak can set you back more than a few bucks. If you’re insecure when grilling a pricey steak, you’re not alone. I can’t tell you how many times students of Barbecue University have sidled up to me to confide it’s the one takeaway they want from the three-day class. Below is a compilation of my best steak tips gleaned over the years from experience, grill masters, and restaurateurs. Select the Right Meat and Cut: The best steaks come graded Prime, which means they have the most marbling (that luscious intramuscular fat). You’ll likely need to buy prime beef at a specialty butcher shop or on line. Of course, fibrous steaks, like skirt, hanger, and flank, also taste great grilled, provided that they are thinly sliced against the grain on a sharp diagonal. (This shortens the meat fibers.) If price is no object, invest in Premium grade dry-aged meat. Good online sources include Creekstone Farms, Strauss,and DeBragga, a New York City butcher who sells premium meats to both restaurants and consumers. One online newcomer is Crowd Cow, which sells distinctive, intensely flavorful grass-fed beef from small farms around the country. Each of their steaks has a unique flavor in a way that reminds me of how a pinot noir wine can taste dramatically differently depending on whether it’s grown in the Napa Valley, Sonoma, Mendocino, Oregon, Washington State, or Burgundy. Season Generously: One of the big mistakes neophytes make when cooking steaks at home is under-seasoning. Sprinkle your steaks generously from a height of several inches with a coarse-grained salt (kosher or sea salt) at least 45 minutes before grilling. Not only does the salt enhance the meat’s flavor in the same way a dry brine does, but it encourages a steakhouse-caliber crust. Or use a rub, like my pepper- and spice-scented Malabar Steak Rub. Another tip from the pros is to add a final sprinkle of finishing salt—a crunchy, big-crystaled seasoning like Maldon or Australia’s apricot-colored Murray River salt—the latter a favorite of Nancy Loseke, my assistant. Salt plus caramelized meat juices make for a taste experience like none other. Keep it Hot, Clean, and Lubricated: You know Raichlen’s Rules—keep it hot, keep it clean, keep it lubricated. 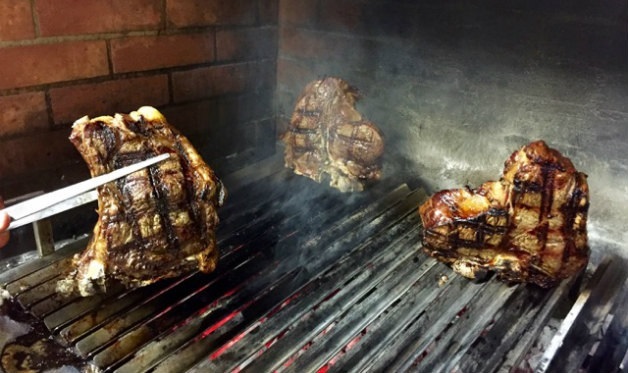 Heat your grill to high—steakhouses cook at temperatures ranging from 800 to 1200 degrees—impale a cube of beef fat or half an onion dipped in vegetable oil on a barbecue fork and rub it across the rungs of the grill grate. An oiled paper towel clasped in tongs works well, too. Of course, I prefer my Grilling Grate Oiler Brush system. Set Up Your Grill for Two-Zone Grilling: Thick steaks (again, 1 1/2 to 2 inches thick) should be charred over a hot fire to develop a deeply caramelized crust, then moved to a cooler side of the grill (covered at this point) to finish cooking. Even gas grills work well for this, though I prefer steaks cooked with natural lump or wood charcoal. Act Like a Pro: Arrange the steaks on the grill grate so they are all lined up in the same direction. After two minutes, rotate each steak. Normally I rotate them 45 degrees. 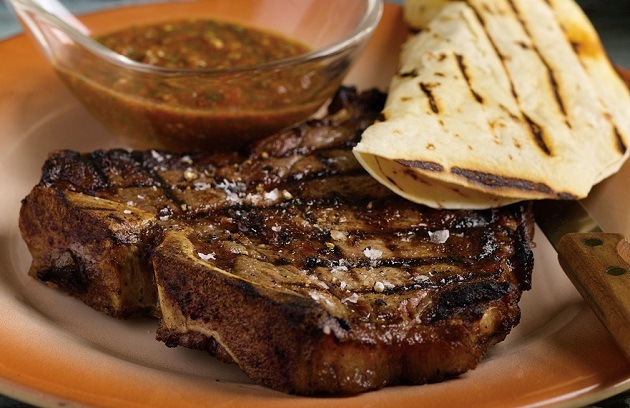 This creates an attractive diamond-pattern of grill marks on the steaks. Cook the steaks until beads of blood appear on the surface, about 3 to 5 minutes per side for a thick steak. Lately, I’ve been using the reverse-sear for steaks that turn out uniformly pink from top to bottom. Know When They’re Done: Memorize the target temperatures for steak doneness. Rare is 120 degrees; medium-rare is 125 to 135 degrees; meat cooked to 140 degrees and beyond is considered medium-well to well. (Hopefully, you will not be cooking steaks to these temperatures.) An instant-read thermometer, inserted through the side of the steak, will give you an accurate reading. Let Them Rest: After you pull the steaks off the grill, a rest of several minutes will contribute much to the steaks’ juiciness. Don’t worry about the steaks cooling; they won’t cool by more than a few degrees (actually, they usually continue to cook for a bit, raising the temperature by 3 to 5 degrees). And the juices, forced to the outside of the meat by the high heat of the grill, will reconvene near the center. 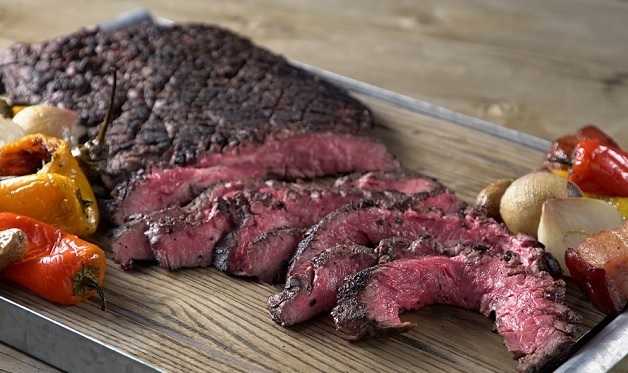 Carve the Meat Against the Grain: This is especially important, as I said, for fibrous steaks like flank steak or tri-tip and will make even tougher cuts seem more tender. 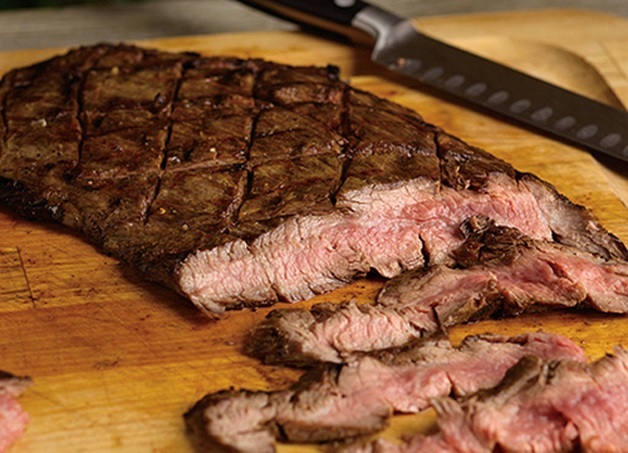 In a cut like tri-tip, the grain can change along the length of the muscle, so pay attention and use a sharp knife. Have any great steak tips? Share them with us on Facebook, Twitter, or the Barbecue Board.